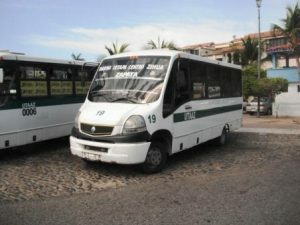 We took the mini-bus from the marina lighthouse to the end of the line, near the craft market and waterfront in Zihuatanejo. We felt compelled to support the local economy, adding to our hat collection and chatting with a Huichol artist, from whom we bought an exquisite beaded vase. The artist showed us his unfinished work in progress, a beaded jaguar. He starts with the form, either carved from wood, cast from a mixture of bone and resin, or sculpted in clay. Little by little, he applies a mixture of beeswax, then applies tiny glass beads by hand to decorate the piece with traditional Huichol symbols and patterns. The process takes from weeks to many months, depending on the size and complexity of the finished piece. 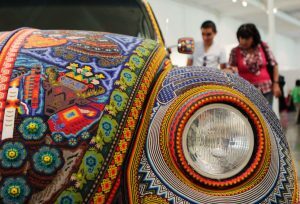 As we chatted, he pulled out books and magazine articles featuring his colleagues and his craft, and the most striking was an article about a group of artists who beaded an entire Volkswagen Beetle, currently sitting in a museum in Germany! Lunch at a more traditional-style restaurant gave us incredible tacos al pastor, made with marinated fresh tuna…and the coldest beer we’ve had in a long time. After lunch, we poked around the side streets until we arrived at the municipal pier and the panga anchorage – and took a look at the yacht anchorage and dinghy landing from the land side. We needed to stock up on a few groceries, so made our way to Aurerra, a huge “big box” grocery store – then caught the bus back a mere two minutes after crossing the street. 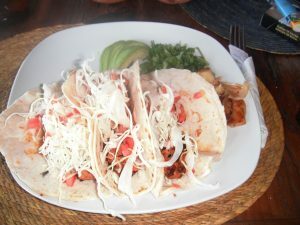 Timing was perfect – as a sailboat called “Rose” we met in Huatulco was arriving just as we were putting the groceries away. Andy and Daneen, from Dutch Harbor, Alaska, are winding up their 10-year circumnavigation, and fully intend to beat their way all the up the coast and out to the Aleutian Islands, their home. Once they were fueled up and settled at their dock, we enjoyed a drink up on our fly bridge, then took them into town for dinner and a long chat about their experiences. They’ve never been to Mexico before…and enjoyed the experiences of both Huatulco and the night out in Ixtapa. We’ll probably catch up with them later in the week, as we’re talking about leaving tomorrow.